In Part I of this article, we looked at the history of the Dynaco ST-70 and some basic differences between the Series II and the original ST-70. In Part II, I will go into detail about the similarities and differences in circuitry between these two versions of this very famous amplifier. I will then present the results of my listening tests in comparing these amps. First let's look at the similarities in circuitry. Both amplifiers are rated at 35 watts per channel. In actual fact they are probably class A up to about 15 watts, and then class AB to the rated 35 watts. The output tubes are 6CA7/EL34. The output transformers are the same ultralinear design. In this design part of the primary winding is fed back to the output tube. This circuit design reduces distortion and gives great sound. 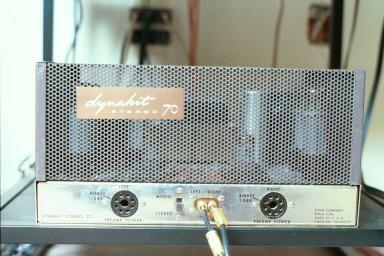 The original ST-70 came from the factory with Mullard EL34 (they were actually labeled Dynaco). The Series II had output tubes by Siemens (labeled Dynaco - made in East Germany). Both amps had the input located at the front of the chassis, and the output terminals located at the back of the chassis. They were both fused at the back. The differences between these two amplifiers shows how 40 years of electronic development can influence a design, even though both are tube amps! The Series II was designed in the early nineties whereas the original ST-70 was designed in the fifties. The most obvious difference between the two is that the Series II had the entire circuitry placed on one double sided military spec printed circuit board made of epoxy fiberglass. This is a very high quality material and will not go bad over time. In sharp contrast the original ST-70 was hard wired, except for the driver circuit which was factory prebuilt on a phenolic circuit board. The problem with the phenolic board was that over time it became contaminated with chemical changes. This change altered the electrical characterisics of the board resulting in changes to the sound. The change in electrical characteristics was not predictable from unit to unit, so ST-70s of the same vintage will probably sound different (other factors being constant) - great! There are some people who claim that hard wired components sound better than their printed circuit board bretheren - personally, I don't believe this claim. The Series II had a nice metal plate covering the driver board. The original ST-70 simply had the driver board exposed to the air (not good if someone accidently pours liquid onto your amp - like at a party!). The next major difference between the amps was the driver section. The original ST-70 used the 7199 tube as the driver. The tube acts as a phase inverter for the output tubes. That worked well for the 50's,60's, and 70's. However, this tube type ceased production eventually and was only available as NOS (new old stock) tubes. Only recently has a Russian or Chinese manufacturer offered this tube. To circumvent this problem of tube availability, but at the same time recognizing the inherent value of the 7199 as a driver tube for this type of circuitry, the Series II used the 6GH8A tube as the driver. However, since these two tubes are not identical they can not be used interchangeably, and the driver circuitry for the Series II had to be redesigned to accommodate this tube. The third major difference was the power supply. The Series II uses a solid state rectification (four diodes). In sharp contrast, the original ST-70 used tube rectification (5AR4/GZ34). This was done for various reasons - some are no doubt related to sound reproduction, whereas others are for practical reasons. Solid state rectification gives sound with more edge. The GZ34 tube supplied with the original ST-70 was the famous Mullard. This tube was a classic and lasted for many, many years. However, production ceased - all that is available now are Russian and Chinese manufacture. The Mullard can be bought as NOS, but it is very pricey. The bias power supply in the Series II used a diode for DC bias. The original ST-70 used a selenium rectifier which over time can go bad as it ages. Frequency response of both amps is rated at 20Hz-20kHz but is achieved very differently. The Series II uses an input filter network to limit the frequency response to specification. The original ST-70 used components within the gain circuitry to control the frequency response. The problem with this approach is that at the frequency extremes gain is reduced, and distortion results as a consequence. What is not widely known, is that the ultralinear feedback point from the primary winding of the output transformers in the Series II design was actually changed to the 8 ohm tap. The original ST-70 used the 16 ohm tap as the feedback point. Since most speakers are typically 8 ohms or less (some are 6 or even 4 ohms), then it makes more sense to have the feedback point in the ultralinear design referenced to 8 ohms (instead of 16 ohms which is never used anyway). The result is less distortion. In my experience with the Series II is that my sample occassionally blows its cathode bias resistor (15.4 ohms, 1%,1-3 watts). I have found that by turning the bias down somewhat so less current through the EL-34s (in other words more negative bias voltage applied), this is less prone to happen. Yet sometimes by 1500-2000 hours of use either left or right resistor blows. I am playing my original ST-70 more to see if the same thing happens. Cathode bias resistors are known to blow, and in a sense it protects the output transformers and power supply transformer from blowing also, because if the bias resistor does not blow, then the transformers will be taken down (and that my friends is very, very expensive!). Cathode bias resistors blow either from aging and use, or from excessive current flow through them for their given power rating. Occasionally, I have noticed, although not all the time, that the resistor blowing is proceeded by thermal runaway of an output tube (it glows red). Thermal runaway may be a characteristic of the tube or the circuit itself, or both. I compared the sonic characteristics of the two amps on my stereo system. 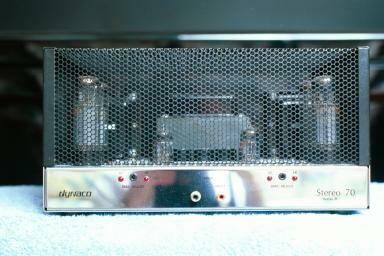 The preamp was a Dynaco PAS3 (using Telefunken 12AX7 tubes). Source material was played on a Dual Dual CS 505-3 turntable (belt driven with an Ortofon OMB 20 cartridge and needle), and a Parasound C/DX - 88 CD player. Speakers were a pair of Paradigm 11se Mark II. For source material I played vinyl records and compact discs (classical and rock'n roll). I tried to listen at the same volume level when comparing the two amps. I left the preamp bass and treble controls in their flat (neutral) positions. I found the original ST-70 to be mellow, smooth, and very laid back in sound. The bass was not very strong. To get good bass, one had to adjust the bass control on the preamp. The ST-70 was especially good for classical music. This amp uses vacuum tube rectification, so as to be expected, it developed sag (a volume drop due to rectifier voltage drop at high current demands) at loud and bass-like musical passages. This amp was very tube-like in sound, and it could be listened to for hours without any fatigue at any volume level! I was very surprised and impressed with the sound of the Series II amp. It was dramatic and dynamic (the opposite of laid back). Bass was very strong. You could feel the bass! This was no doubt due to the increased capacitance of the power supply, the increased size of the power transformer, and the solid state rectification. The sound was wonderful and addictive - one could listen for days! The amp sounded fast and responded quickly to musical passages (due to the diode rectification). The Series II had the characteristics of a tube amp, but at the same time had some characteristics of a solid state amp. I found this amp to be best for rock'n roll. At higher volume levels my house really rocked! It is amazing that the living room bay window did not break. Who knows what the neighbors thought! So, which amp do I like better? I have to admit that I like both, and use both alternately. It all depends on the type of music you play. Both are really great amplifiers - a treat for the ears! Neither the Series II nor the original ST-70 is manufactured now, but can be easily obtained used (after all over 300,000 of the original ST-70s were manufactured). I suggest looking at the internet auction web site http://www.ebay.com. In the search field simply type dynaco. There are always ST-70s up for auction (the Series II less frequently because much less were manufactured). The going rate is US$250-450 depending on condition for either of the amps. Keep in mind that there were many versions of the ST-70s. The only ones that I like are 1) the ones where the output transformers were stamped A 470 and have the cloth covered leads - these were the very first ST-70s, and 2) the Series II amps.